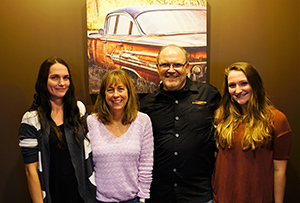 Owner Dan Buss has spent his entire life on the North Shore in the Auto Service Industry. Growing up in a family that was in the Auto Parts Business, Dan knew at an early age he had a passion and love for cars. In his early teens, Dan spent his afternoons helping around various gas stations cleaning up and observing the servicing of vehicles. After High School, he worked full time during the day at various gas stations and auto service and repair centers while attending college at night. While working during the day and taking classes at night, he learned the ins and outs of the auto repair business. Every shop he worked at he learned more about how he wanted his auto repair shop to operate and how he wanted to service his clients. Dan spent many years working in the auto service industry, and through his extensive mechanical knowledge of automobiles he became an expert diagnostician. Eventually, he made his way out of the backroom by applying his knowledge of auto service and repair along with excellent customer service skills straight to the counter, providing his customers the knowledge to properly service their vehicles. Dan became a partner of the company during a location move, and three years later, he became sole owner. It has been his hard work and understanding of not only auto repair, but an understanding of how to treat his customers to the highest level possible, that has made D&R Autoworks successful.